Happy St. Patrick's Day everybody! Woohoo! There are usually three things that I can do with my unofficial-irish-ness on this particular day. No, drinking is not one of them. One, ya gotta wear green (for me, it's often inadvertently). Two, ya gotta eat something green. Three, ya gotta have corned beef... MMMMM, oh I adore corned beef! 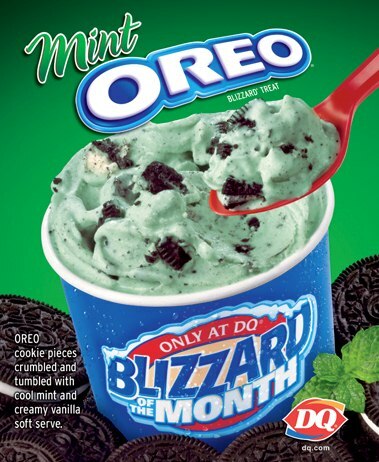 Anyway, if you are trying to avoid green beer, or more importantly trying to avoid a certain green shake (which has a fanbase yet seems to have nothing but bad reviews online), why not try a green blizzard? Now I'll say up front what you are probably already thinking: you're going to flash black to the thin mint blizzard on your very first taste of this one. The mint flavor is the main player here, with cookie bits backing him up. I did indeed think thin mint at first, but as you bite into the larger cookies & cream bits, you do realize this is not 100% the same, just very similar. You can see from the picture that there are tiny cookie bits everywhere, and the mint flavor, while varying in color, seemed strong yet balanced in every bite. Like most blizzards, there were a few bit cookie chunks, but not a ton. Now I did have to wait for a day when I was really hungry and then struck with the urge for a minty treat, but that's just my general opinion of mint products. Overall I enjoyed my treat which did a lovely job of replacing the leftovers I usually bring for lunch. 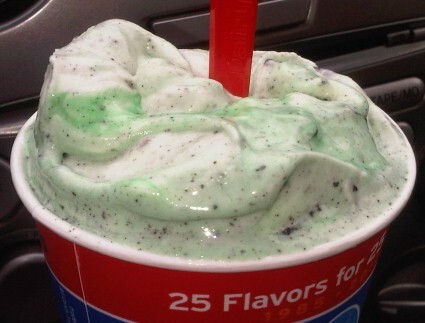 It was surprising to me that I found something very enjoyable about a mint blizzard. I guess the mint base is in just the right frozen-liquidy state for maximum satisfaction. mm i love mint flavoured things, this looks so delicious! now i have to admit that i totally agreed with your posts about how shakes are just milk and ice cream, but that looks so bloody good.